While Benchmade has lost some of its lustre for me due to what some might describe as questionable business practices, I still enjoy some of their knives quite a bit. One of the recent knives that really caught my fancy when handling it was the Bob Lum Onslaught. While its no secret that I am a big fan of Bob Lum’s designs, Benchmade has also done a good job on the fit and finish of this folder. 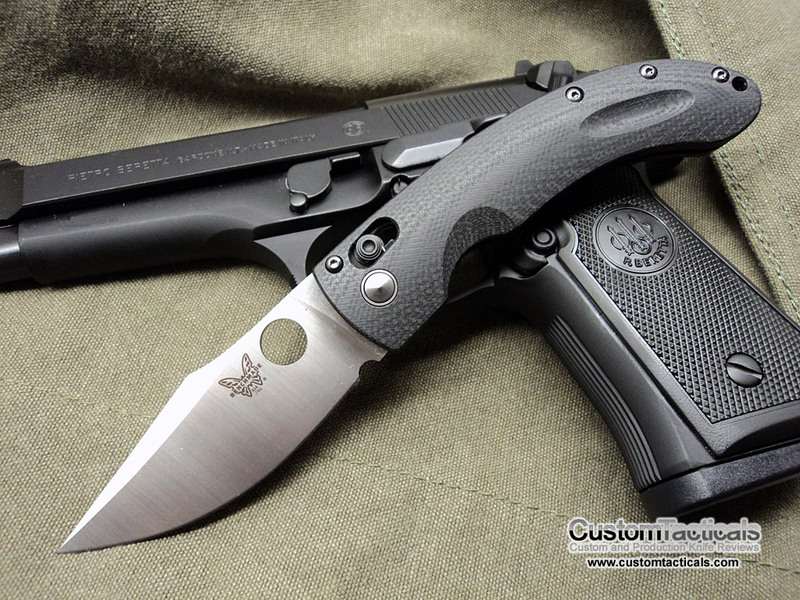 While I personally really like the Mini-Onslaught, Benchmade’s 746 is also the younger brother of the full sized Onslaught, 2010 Shooting Industry Academy of Excellence Knife of the Year, which means someone else does too! The 746 is designed by Bob Lum, and part of Benchmade’s Blue Class line of knives. It features Benchmade’s tried and true Axis Lock mechanism which features 420J stainless liners. Blade on the Onslaught is the workhorse 154CM stainless steel, and unlike most Benchmades in the past, comes sharp enough. I’m not sure why some guys seem to think Benchmades all come sharp.. I have not found this to be the case. Blade measures 3.45″ and grind is a full flat grind with a short Rhino-horned portion that has a swedge grind on it. Blade has a big belly and what Benchmade describes as a modified clip point blade. Blade is opened via a round hole opener like Spyderco. Handle is a bead blasted G-10 type of finish, with a little handle dimple – a Bob Lum signature. No jimping and all smooth lines on this handle, giving it a very smooth in-hand feel and still decent grip and purchase due to the finish on the G-10 and the dimple. Handle feels very good in my medium sized hands, and could even work for slightly larger hands than mine. This is where I feel this knife has excelled. Many Benchmades in the past didn’t have the level of Fit and Finish that I was expecting, especially at the price points these knives have been selling at. The 746 Onslaught is relatively affordable and also has very nice lines. The finish is consistent and smooth, and the action is without play. The finish on the blade looks great and also has crisp grind lines. The custom pocket clip looks good and does a good job of reinforcing the lanyard hole, but it would have been nice to have a deep pocket clip. Overall a very nicely made knife with a superb fit and finish. I am a big fan of the Onslaught and it has slightly restored my interest in newer Benchmade Product. Very nice knife with fantastic build quality at an affordable price, with a very versatile modified clip point blade. 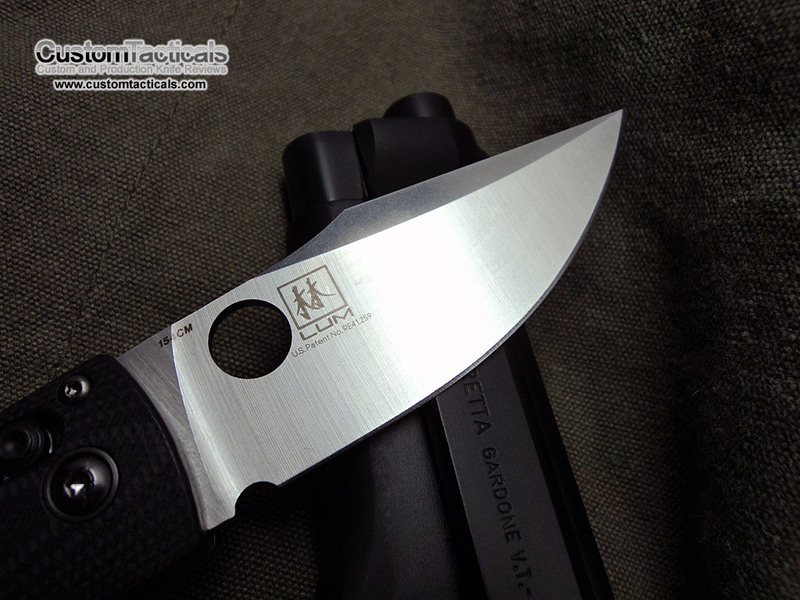 If you are looking for something with a bit more belly in the blade and 3 1/2″ of steel, this is the way to go. Some cons would be the non adjustable tip-up pocket clip and the Axis Lock if you don’t like it.